It’s touted as the “most wonderful time of the year”. In the big picture the holiday season truly is; but when you add kids to holiday stress it can feel anything but wonderful. With that said, you don’t have to walk around ready to snap every time one of your elves yells “Mommy”. 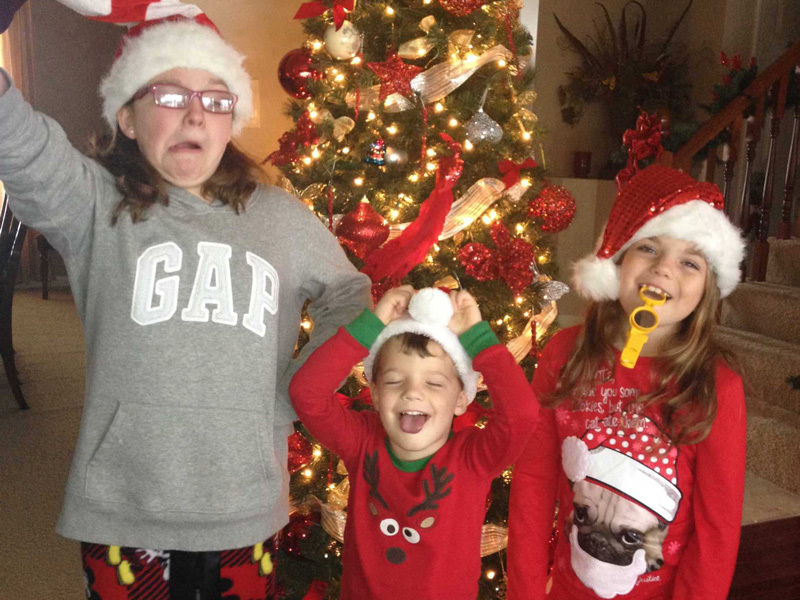 Instead, take a deep breath and follow these tips to survive the holidays with your kids. Kids feed off their parents’ energy. If you’re a frazzled stress ball running on caffeine and no sleep because you’ve been baking all night long, your kids will sense that. Don’t be surprised if they start acting like a pint-sized version of you! Add your stress to the excitement of the holidays that kids often feel and you have lots of…energized kids, to put it mildly! Take a deep breath and try to de-frazzle yourself. Whether this means taking a “time-out” for you or finding time to have a cup of herbal tea, know that a relaxed parent is worth more than one who’s too stressed to enjoy some holiday spirit. By setting an example, your kids may be more apt to just chill out. One of the big stresses of the holiday season comes with all the “I wants” kids have during this time of year. When toy books start coming before Halloween, kids get a jump start on their holiday wish lists. Lucky parents! Before things get out of hand and childhood pipe dreams get crushed, get real with your kids. While they can surely ask Santa for what they want, explain that Santa has tons of other kids to buy for so there’s a good chance they won’t get everything on their list. For older kids, set a monetary limit. This way everyone is aware of how expectations co-exist with reality. If you need a break, ask for help. There’s no shame in it! Sometimes a little break is just what’s needed in order to push through the holiday season. Asking someone to watch your kids for a few hours doesn’t make you a bad parent. Quite the contrary; realizing you need a break is a good thing. Remember, it takes a village, especially during the holidays! 4) It’s okay to say no! Holiday visits and parties can lose their luster when you’re attending them like you’re shopping in bulk. That’s why you don’t have to accept every invitation. Kids get tired and when they get tired they get cranky, which makes you cranky. If you know cramming in three family visits in one day is going to turn your child into the Grinch, then say no to one or two. Knowing your family’s limits is one of the keys to survival over the holidays. If the holidays include a trip to grandma’s house, travel smart. This means avoiding rush hour if you’re travelling by car to limit the amount of times you’ll hear, “Are we there yet?” If you’re travelling with a baby, this could mean scheduling your departure for nap time so he or she will sleep part of the way. If you have older kids, have them bring a book along or invest in a travel DVD player to help them pass the time. When travelling by plane be sure to also have activities and snacks handy. Those airplane peanuts aren’t going to cut it with your kids. If you travel smart with your kids, it will make for a much smoother ride and a more relaxed you. A holiday break for your kids is anything but for you. Planning activities ahead of time can avoid the dreaded “I’m bored”. If you’re working during their time off, try to find a friend or family member to babysit and provide some cool activities for them to do. Arts and crafts are always a good option to pass the time. Another great idea is to sew together (Thanks to Angela, Mrs Taylor and Casey for sharing this link with us!). Besides planning activities for your kids while you’re working, block off some special time for them when you get home. Maybe take them to their favorite restaurant or get take-out and have a family game night. Anything that will bring fun into the mix will drive the holiday stress away and help you survive the holiday season with your kids!